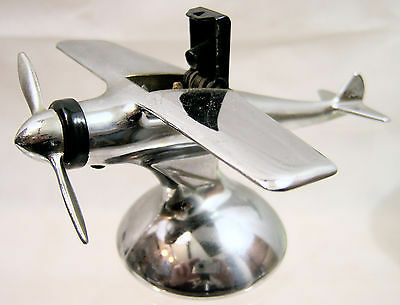 This style of Chrome Plated Table Lighter was highly popular in the late 1950s/1960s, often used as a presentation gift to an aviation enthusiast, especially one who smoked. 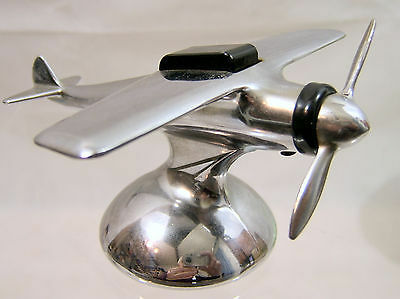 This one also makes an excellent desktop paper weight given the weight of the airplane. This version is a polished chrome single engined High-Wing Monoplane, probably based on the 'Spirit of St Louis'.. The lighter segment is contained within the fuselage which is activared by a quick turn of the propeller. It should be noted that this action is not as efficient as it once was. It is not damaged in any way. It has been precision turned and is a magnificent model and makes a worthy table decoration. The aircraft is completely static so does not swivel to find a different angle. It has a length of 5 inches (12.5 cms) and a wingspan of 6 inches (15.25 cms). From the ground the overall height is 3.25 inches (8.5 cms). It is excellent condition.